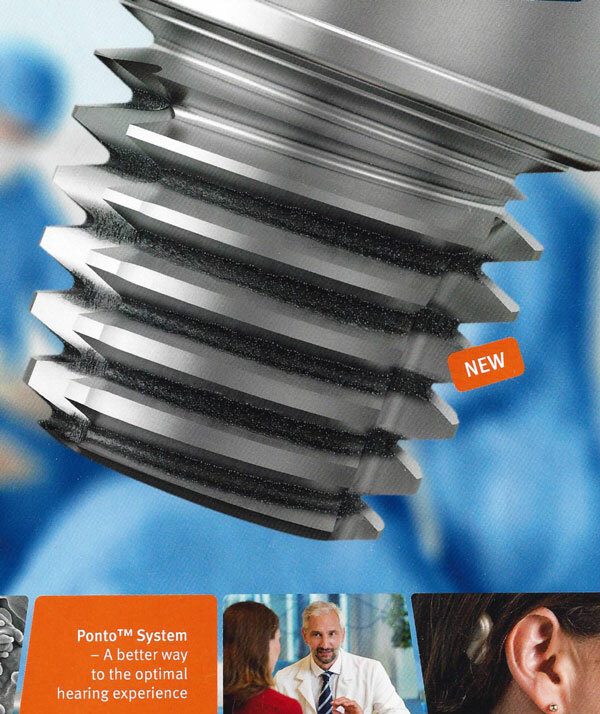 The Ponto osseointegrated hearing implant is a titanium fixture and abutment that is surgically implanted in the bone behind the external ear (post-auricular area) and is used with an external bone conduction sound processor. The Ponto is the newest of the osseointegrated implants to be introduced to treat mixed and conductive hearing loss and single sided deafness. Side View (left to right): Ponto Sound Processor, abutment screw, abutment, fixture. 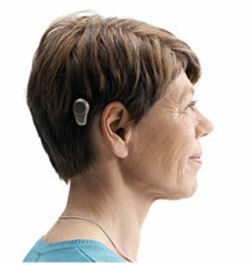 The Ponto has many similarities with the first osseointegrated implant, the BAHA hearing implant. The BAHA has been successfully used to treat over 35,000 patients worldwide and consists of a 3-4 mm. 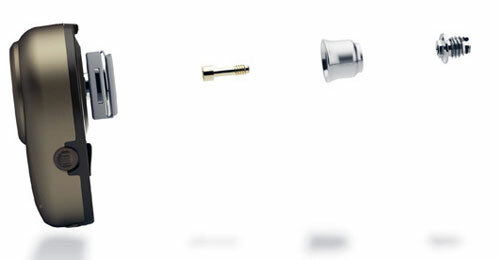 titanium implanted fixture (available in various lengths such as 4 mm, 8.5, and 9.0 mm i) with an attached abutment that is surgically implanted in the skull bone behind the ear. An external digital sound processor containing directional microphones and a battery supply is then "snap coupled" to the abutment. The surgical procedure is performed under general anesthesia and takes approximately one hour. The fixture is permitted to heal into the bone for 6 weeks before the external sound processor is attached. The BAHA implant requires minimal skin care, does not occlude the ear canal, and provides hearing to both inner ears by completely bypassing the outer ear, ear canal, and middle ear. Osseointegrated Hearing: For patients with conductive or mixed conductive-sensorineural hearing loss, the Ponto transfers sound to the ear on the same side through direct bone conduction. Side View: Woman wearing a Ponto, behind her right ear. We receive sound in two ways, by air conduction via the ear canal, eardrum, and ossicles, and by bone conduction where the sound is transmitted directly through the jaw and skull bone bypassing the outer ear and the middle ear. In most cases, hearing impaired patients will be fitted with air conduction devices. These are placed inside the ear canal or behind the ear. However, some hearing impaired patients are unable to benefit from this type of conventional hearing aid. They may have a congenital condition, such as never developing an ear canal (atresia) so there is no functional ear canal present in which to place a hearing aid. They may have chronic ear infection in the middle ear or the outer ear that is made worse when a hearing aid mold is placed in the ear canal causing occlusion. Another hearing loss condition is "Single Sided Deafness" (SSD) which may be due to previous surgery, trauma, ear disease, sudden hearing loss, etc. which leaves the individual with no hearing in one ear. Traditionally, patients with SSD were offered either traditional bone conduction devices which were large, cumbersome, and required the wearing of a steel spring headband or a CROS hearing aid system (contralateral routing of signal). CROS devices required wearing a microphone on the dead ear connected by wired or wireless connection a second hearing aid in the opposite ear. 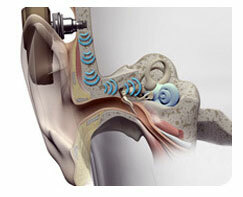 Single Sided Deafness: The Ponto fixture abutment is implanted on the side of the deaf ear. The Ponto Sound Processor is attached to the fixture abutment. Sound is heard by the Ponto and is transmitted through the skull to the normally hearing ear. In other words, the Ponto makes it possible for one to hear from their "bad side" in their "good ear". The patient experiences pseudo-localization ability and enhanced overall function. The Ponto hearing implant works through a different approach to bone conduction. Whereas traditional bone-conductors are transcutaneous and work by exerting pressure against the skull, the Ponto system works percutaneously. 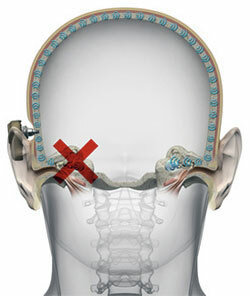 A small titanium implant is implanted in the skull behind the ear where it osseointegrates with the living bone. A percutaneous abutment is attached the implant, and a sound processor is surround coupled to the abutment. The sound processor can be worn or taken off at any time. The Ponto sound processor is comfortable, discreet, and features a unique side push button control rather than small dial or tab button controls. Bone anchored, osseo-integrated implant surgery has evolved over time. Originally, bone anchored implants were 4.5mm in length. It was necessary to debulk scalp skin and use a skin graft to prevent the attached sound processor from contacting the skin. 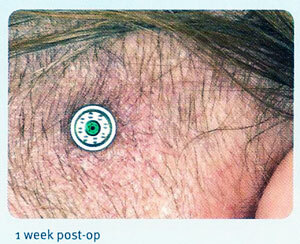 As implants became longer, debulking and skin grafts were replaced with vertical incisions and minimal debulking. Today, longer implant design permits using a skin "punch" technique without debulking. In this spirit, Oticon engineers have developed instrumentation to permit surgeons to perform a punch technique with minimal tissue trauma and shorter operative times for patients. The current procedure is called "Minimally Invasive Ponto Surgery" or MIPS. MIPS permits tissue preservation, is less invasive, eliminates the need for suturing, and helps to keep scarring to a minimum. Oticon engineers have enhanced their OptiGrip implant geometry and latest implant surface technology to create the Ponto BHX implant. 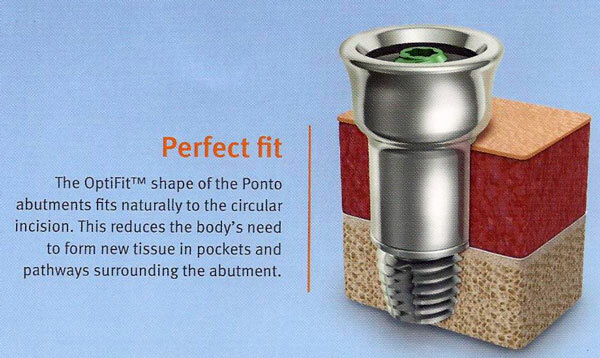 The Ponto BHX uses laser-ablated titanium surfacing to create micro and nano-sized structures that facilitate bone bonding with the implant. The technique is called Biohelix and enables a site specific modification between the threads of the OptiGrip geometry. A three level surface topography is created that matches the natural bone structure at the macro, micro, and nano-scale. Ultimately, better implant-bone bonding should result in improved sound transmission and sound quality. Ponto countersink with stop to improve safety during implantation, countersinking is limited to 0.3mm. The Ponto sound processor is available in a power model for patients who may require increased gain. 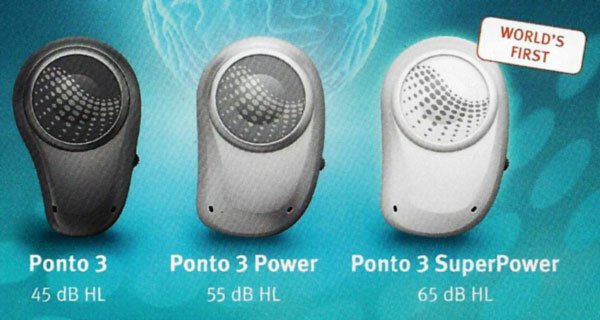 Ponto Sound Processors are available in four colors as shown above. At this time, The Ear Center is unable to order an upgraded Ponto sound processor for Ponto users. 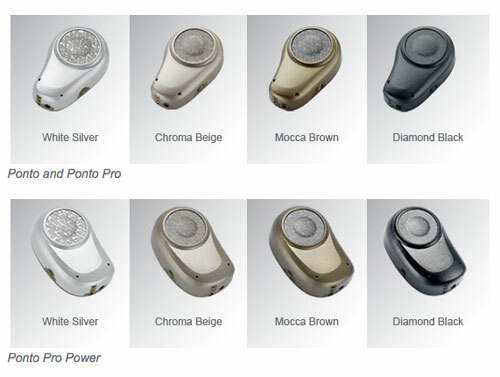 It will be necessary for you to contact Oticon Medical's toll free insurance support line at 1-855-252-2777 or email to Oticon Medical at info.oticonmedicalusa.com. 1. Goldman RA, Georgolios A, Shaia WT. The punch method for bone-anchored hearing aid placement. Otolaryngol HNS 2013, 148(5):878-880. 2. Gordon SA, Coelho DH. Minimally invasive surgery for osseointegrated auditory implants: a comparison of linear versus punch techniques. Oto HNS 2015, 152(6):1089-1093. 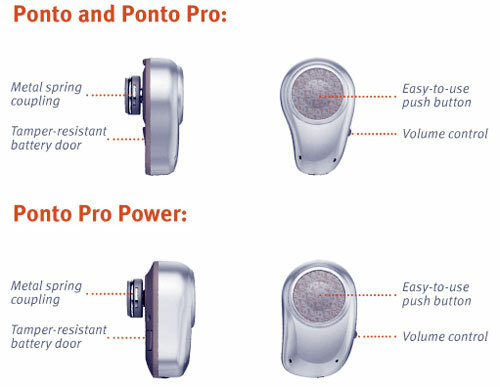 If you would like to learn more about the Ponto Hearing Implant, please visit the Ponto website at www.oticonmedical.com/ or contact our office at 336-273-9932 and ask to speak to one of our audiologists.